This year, I am lucky enough to be teaching a STEAM class in which our first module is a Challenge Based Learning project. It is such an interesting class to “plan” for because the majority of the work is driven by the students’ decisions. To keep myself organized and on track, I am using Apple’s CBL Classroom Guide as much as possible in my planning. I would LOVE ANY and ALL ideas/feedback from anyone who has experience with this to help me along the way!! The first day of our class, I started with the word “Interdependence” written on the board. 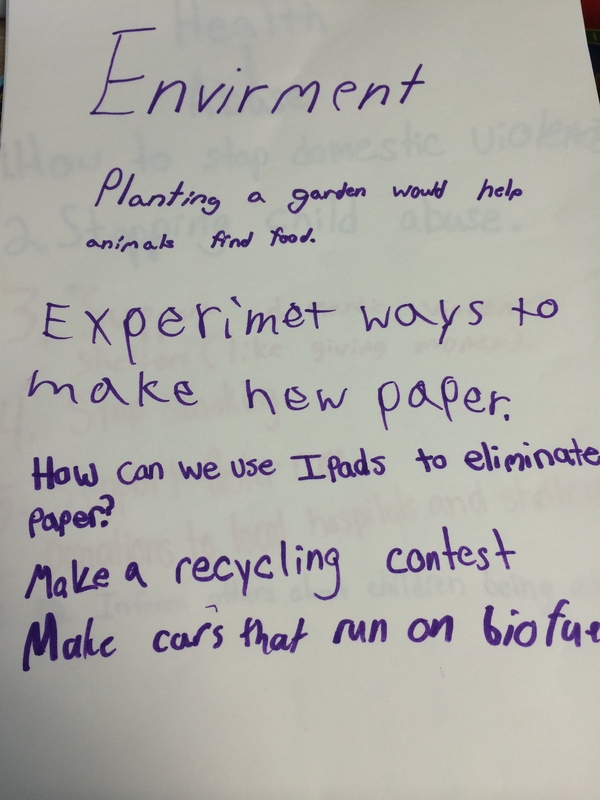 It is connected to our first science on Ecosystems and I thought there were many big ideas students could draw out that affect interdependence in our world. 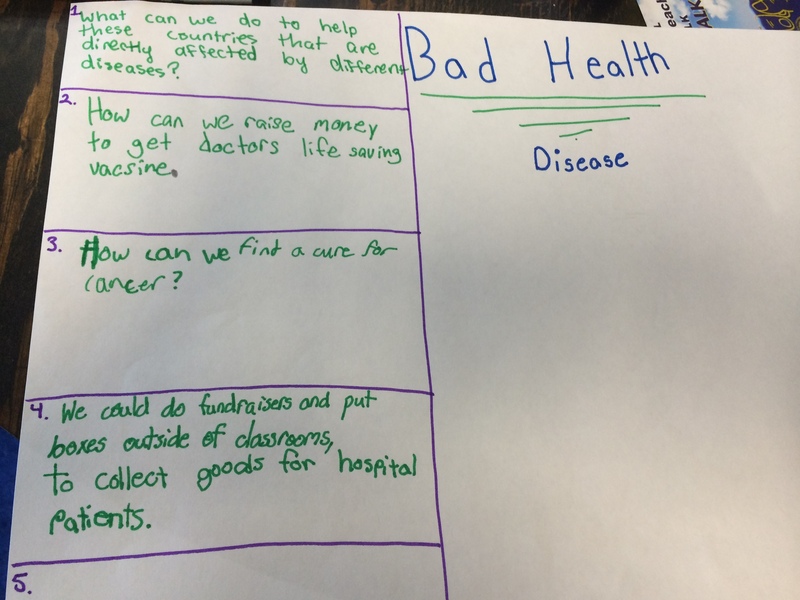 The class first brainstormed very specific ideas such as pollution, animal extinction, illness, deforestation, abuse, war …etc, so I then asked them if there were broader ideas that encompassed more than one of their ideas? 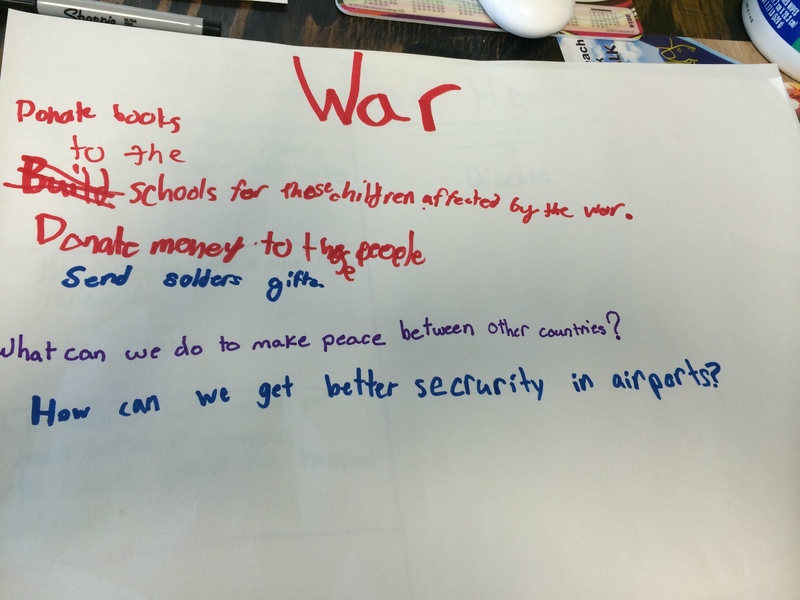 From there they came up with: Health, Conflict and Environmental Issues. 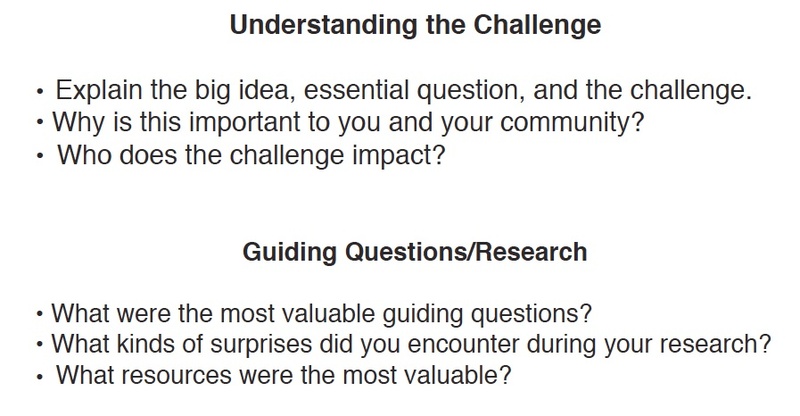 The next day, I put each idea on a piece of paper and had groups rotate to each one to formulate questions or ideas that could evolve into their challenge. We watched some sample Challenge videos and this week, students are working on creating an invitation video to their challenge. My vision is that we have a group opening and closing with each group’s project passion that include: helping the homeless, helping those suffering from cancer, helping those affected by war, and helping the environment through recycling (starting a recycling program at school). 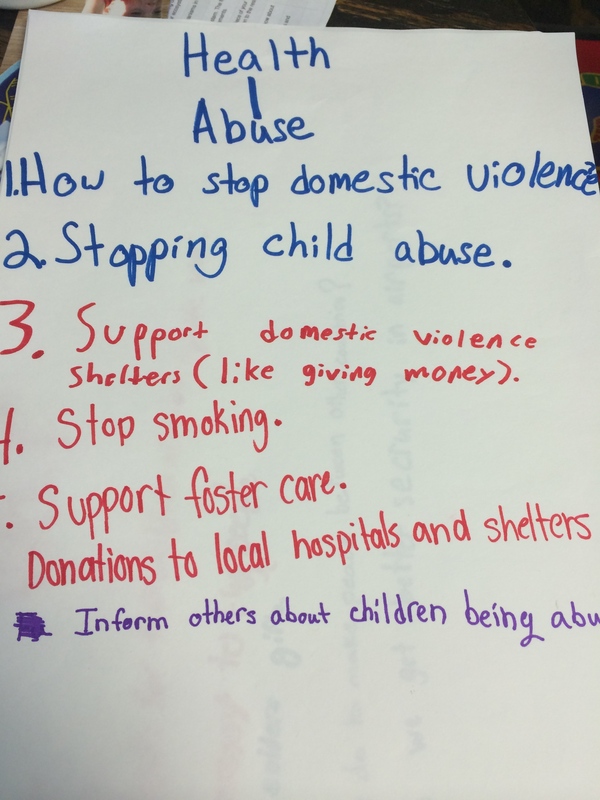 We agreed, as a class, to raise awareness and money in the same ways, so we will be working on solution ideas together, and then the money raised can get split equally among the groups. Don’t know if this is right or wrong, but I am excited about the student ideas and seeing them passionate about such great ideas. I will share their video as soon as it is complete and document our journey along the way. The next piece of planning I need to do is setting up a “reflection room” for students to document their journey as well. I welcome any ideas to help make this the best learning experience for my students! This entry was posted in Uncategorized on October 12, 2014 by mathmindsblog. Love this addition to your arsenal Kristin. Looking forward to hearing about how you and your students develop this idea in the months to come. Thanks for sending me down another rabbit hole. No really…thank you! You are SO welcome Graham!! Hopefully you can learn along w/me and help me out! Just read your latest post and that is so interesting. I have always thought when Ss say “jump down a row” when adding ten that it sounds so oxymoronic (if that’s even a word:). Then I start to wonder, what if a student counted by columns? Like when we do our decimal grids for tenths and hundredths, they shade left to right with 1-10 being in the first column. Hmmmmmm..,.interesting! we are just beginning the CBL journey at my school. I like that you put plan in quotation marks because thats really how it feels trying to wrap my head around it. 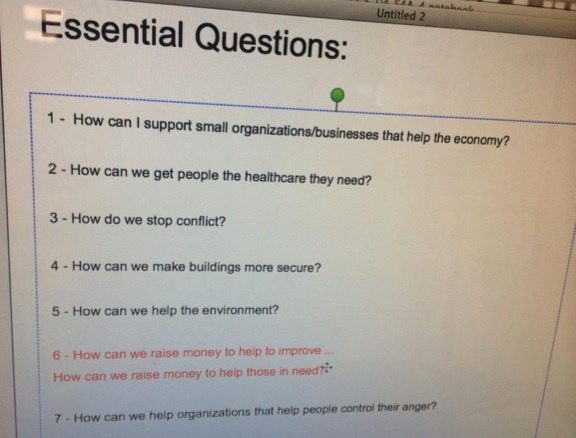 What you are doing sounds awesome and I like the process you led the class through when they were trying to generalize their questions and passions.